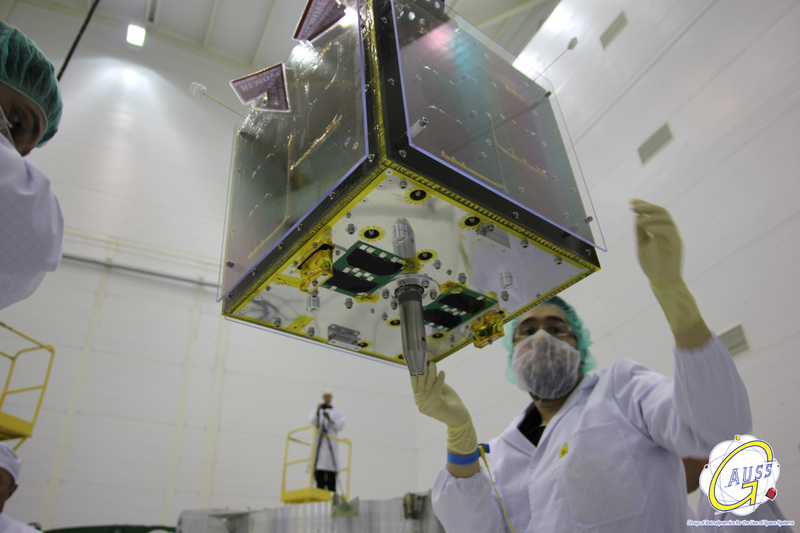 UniSat-6 is a civilian scientific satellite, mainly intended for customer’s equipment testing in space conditions. The satellite has a total mass of 26 Kg and it has been built in Italy. UniSat-6 was launched on the 19th of June 2014 at 21:11:11 CET from Dombarovsky Cosmodrome at the Yasny launch base (in Russia) on board a DNEPR-1 rocket from the company Kosmotras, and it entered into Sun Synchronous orbit 16 minutes later. Communications with ground controllers were acquired 90 minutes after launch when passing over Italy. Concerning the satellite design: UniSat-6 is based on the UniSat-5 satellite platform built in reinforced aluminum and carbon fiber honeycomb panels. It measures 40 cm × 40 cm × 40 cm in size with a weight of 26 kg. Thermal range was designed to be between -10 to 10 degrees. 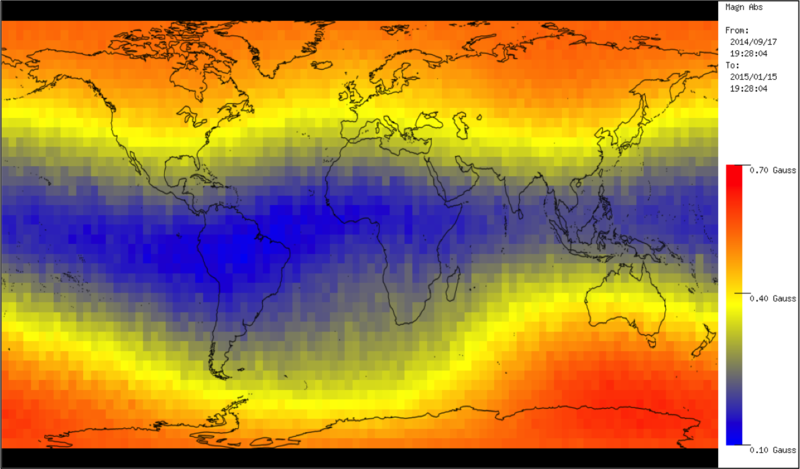 Power is provided by body-mounted solar panels, which provide from 11 W (4 sides) to 5W (bottom) of electrical power. The satellite has a passive attitude control system, which uses permanent magnets designed to keep the satellite spin stabilized from 5 to 10 degree per second. Command uplink and data downlink is provided by an UHF communication system. 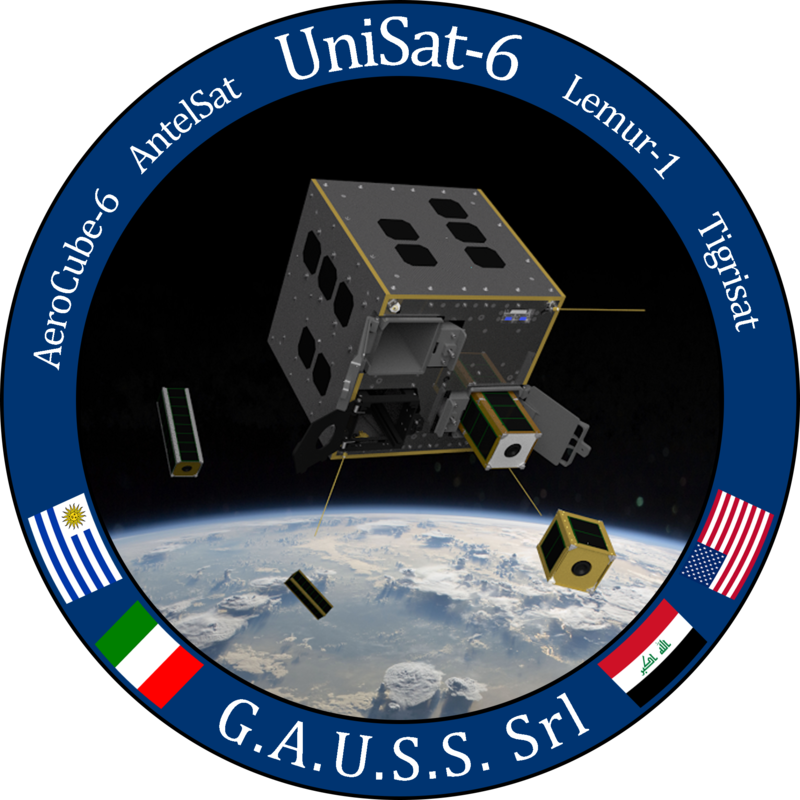 UniSat-6 deployed the CubeSats Tigrisat, Lemur-1, AntelSat and Aerocube 6 from two Pico-Orbital Deployers (Tyvak) and one GPOD (GAUSS Picosatellite Orbital Deployment). The deployment of the satellites took place 25 hours and 38 minutes after the launch and it was initiated by an autonomous system with a dedicated battery. Confirmation of the deployment was given 15 minutes after release when the satellite passed over ground stations in Italy. UniSat-6 has onboard a 3Mpx telecamera with a maximum resolution on ground of 400m per pixel. This camera was used to take a picture of the CubeSats after their release and to take Earth imaginary and to develop and train ground operators in the process of Earth Observation. 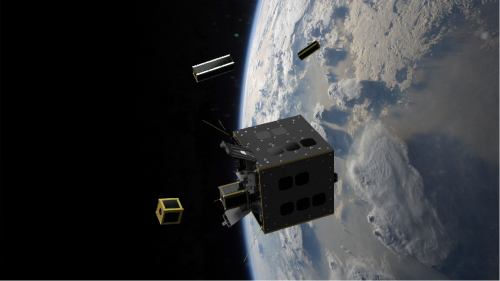 Cluster Mission of 32 satellites (37 considering the payloads of UniSat-6). Tigrisat: A 3U CubeSat satellite built by Sapienza University of Rome with the support of Iraqi students during an 18 month high level course at the Scuola di Ingegneria Aerospaziale. This relevant research achievement has allowed the Team to further study electronic components developed for microsatellites and then to gather data useful to understand a satellite behaviour when in orbit. UniSat-6 has been regularly operating since entering into orbit and the ground station in Rome managed to establish a two-way effective communication with it a few minutes after launch. 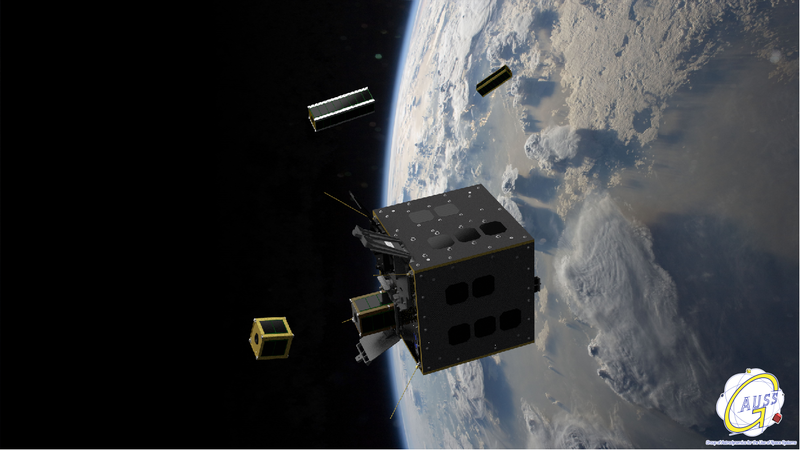 The communication goes through the hardware onboard, like the new OBC ABACUS that uses a CubeSat form factor (PC104) and that has been developed at the School of Aerospace Engineering (“La Sapienza” University of Rome) in collaboration with GAUSS Srl. UniSat6 Image acquisition of Italy (right), compared to a meteosat picture simultaneously (top left) and a satellite position during picture acquisition (low left). Some of the pictures of the satellite are gathered in the photo gallery. 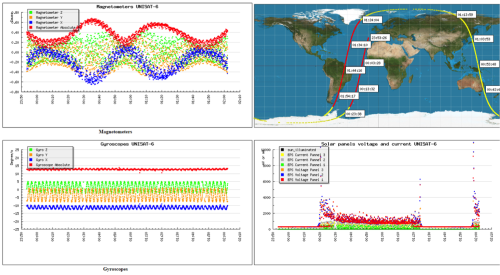 UniSat6 angular speeds. 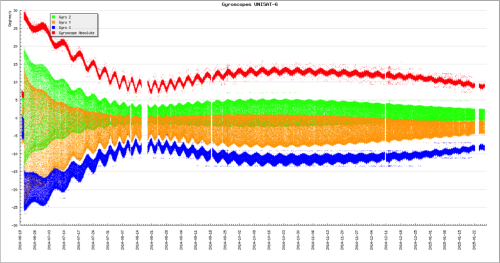 UniSat 6 is spin stabilized on X axis. UniSat6 magnetometers (top left), gyroscopes (low left), Input power (low right) and ground track (top right) on 2 hours time frame. 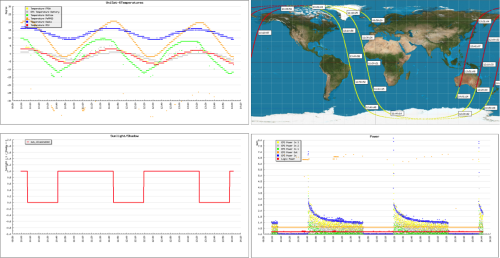 UniSat6 temperatures (top left), Sun light (low left), Power (low right) and ground track (top right) on 2 orbits.